Blizzard's working on unearthing the classic RTS games from their MS-DOS prison. In this modern age of gaming, World of Warcraft has taken the modest plotlines of the original strategy series and successively worked on each over the past decade. Crusades burned, Lich Kings wrathed, and then the entire world blew up. 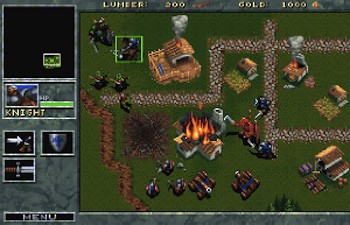 Players who want to explore the full backstory can play the fantastic Warcraft 3 and its Frozen Throne expansion pack, but the older games are sealed away under an arcane sigil known as MS-DOS. Blizzard has a team of arcane scholars working to get the classic games ready for a future rerelease on modern PCs. The news was revealed at Blizzcon 2013, when WoW production director J. Allen Brack was asked if Blizzard planned to rerelease any of the older Warcraft titles. "So, we actually have a guy on our team - actually several guys on our team - who are actually working on a side project to do something like that in some form or fashion," Brack answered. "We're fans of Warcraft 1, Warcraft 2, Warcraft 3, and we'd love to replay those games for sure." Warcraft: Humans and Orcs was released back in 1994 for MS-DOS. The next year brought Warcraft 2: Tides of Darkness and the Beyond the Dark Portal expansion soon after. Outside of Ebay and DOSBOX, there's no legal way to obtain these classics. While Blizzard hasn't talked about the nature of these rereleases, it just released the Warcraft contemporary Blackthrone for free via Battle.net. However you can, it would be good to brush up on the past before Warlords of Draenor drops!